Assault of the Banished One! Undead minion rebellion?! Scattered throughout Lore are the undead minions of necromancers; most of them cannot talk or think. They can only do the bidding of their Masters. But some... some DO remember their time as humans, remember what it was like to be free. And those that do have passed down through generations of undead the story of the Desterrat Moya - the Banished One. An entity which inhabited this plane long before Lore's current pantheon, this creature has clashed with gods... and lost. An Elder One from the time when the stars we see were dark, the Moya is very powerful and grows stronger feeding on the pleas and petitions of the undead minions who can still think. However, though they look on the Moya as a deity, they do not comprehend its true nature and that may be their downfall! Their cries have strengthened the Moya enough that it has broken free of the dimension where it has been sealed away, and now it travels to us! The undead* believe the Desterrat Moya comes to free them... but it has different, deadlier plans. Work with Knave1, King Alteon's Royal UndeadSlayer, to save Lore from the threat of the Banished One and prevent an undead uprising! Look for Knave1's rewards shop, awesome monster drops, and a few rare boss drops from the Moya! Plus, the Interfector Deorum helm will be released, as well as new spear weapons! 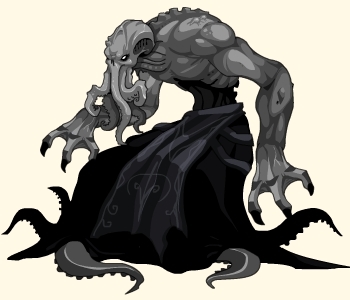 * Although Dage the Evil created the art for the Desterrat Moya, Knave1's storyline is not connected to his Undead Legion. Good question though, Askewen! Who is Knave1 and why does he get a story? Knave1 is the winner of the final I Can Has Mod contest! His wish was for his own storyline, an armor, and his own NPC. He asked to be King Alteon's personal UndeadSlayer and wanted your help to slay an Undead god. We thought that was a REALLY cool wish and immediately started planning out how to realize his dream. 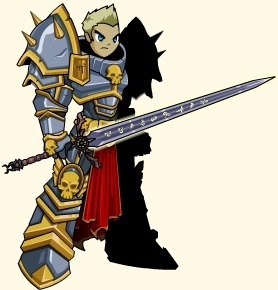 Originally the Final Cheezburger item was going to be called the GodSlayer Armor, but in response to many players feeling uncomfortable with the name, we decided to call it the Interfector Deorum Armor. ** It keeps the spirit of the idea but is not as abrasive for a lot of you guys. So if you're wondering where you're Final Cheezburger went in your inventory, look for the Interfector Deorum Armor! ** With players from around the world, all of whom have different backgrounds and ideologies, creating content that pleases the majority can be a challenge. This time, we got enough negative feedback about the original name of Knave1's armor that we felt it would be more beneficial to the community as a whole to change it. Hero, your planet is in peril, and NOT just from the Desterrat Moya! Pollution can kill a world dead just as easily as an attack from an inter-dimensional deity! This Friday AQWorlds celebrates Earth Day with the return of General Pollution, Captain Lore, and all the epic Earth Day seasonal rares! Thyton in-game Livedraw Wednesday, 4PM! Quick as a ninja, Thyton's going to appear in-game this Wednesday at 4PM server time, draw an all-new weapon based on your suggestions, and disappear in a cloud of smoke! Make sure you log in and /join stream to watch the event! A shop will be available for you to purchase the item which will turn into whatever Thyton makes! This is the third in our series of in-game Livedraw events! Grenwog, Lucky Day, Evolved Leprechaun Class Gone! It was egg-citing while it lasted, but then our luck ran out! Grenwog and the Lucky Day Fair, as well as the Evolved Leprechaun Class, have all vanished. They will return next year with all new seasonal rares! Your luck is in! (Even if Lucky Day is out.) The Artix and Sepulchure Action Figures are currently on a boat in the middle of the ocean, making their way here! And the timing could not be better, because DoomWood: Part 2: Whispers of the Darkness Lord begins in TWO WEEKS! To kick off the storyline, we will be releasing a stop motion battle video of the upcoming Sepulchure and Artix action figures which was created by our new friend from overseas. He took the figures apart, added a bunch of extra joints, and... well.. he sort of "robot chicken-ized" it. If you want Artix and Sepulchure Action Figures of your own, you'll be able to find them at Heromart and US Toys R Us stores! 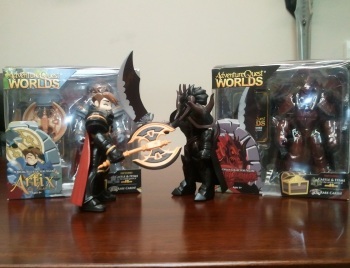 Each action figure contains 5 rare cards to go along with out BattleOn Battle Card Game and includes a code to unlock the Caste or Doomknight item set!